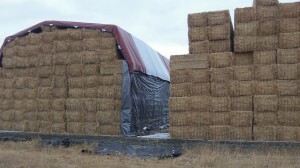 Huge stacks of straw — a result of no field burning. For about a week recently, people in parts of Southern Oregon were choking on smoke from many forest and brush fires in that area. It got so bad that some residents who had the means left for other parts of the state, at least for a while. At last report, the situation had improved. The air had cleared even though the fires themselves were not yet out. Hearing about all this from the Willamette Valley, I was reminded of the big change that took place here in 2009 and 2010. In ’09, the legislature passed a bill that virtually banned field burning, with the ban taking effect the following year. Since then the late-summer sky has remained clear in the mid-valley, except for occasional dust from working the fields. No more pillars of smoke, which sometimes used to sink back to ground level mainly on the valley’s east side, especially the Santiam Canyon and Sweet Home, and to a lesser extent Lebanon. From Mike Reynolds: That field burn ban certainly must have its exceptions. Twice this summer so far, Sweet Home has been inundated with field burn smoke. Granted, far less than the pre-ban days. But somehow the DEQ managed to pick Jamboree weekend to be one of those exceptions. Friday evening the field burn smoke was thick in Sweet Home and slow to clear out. You would think DEQ could at least give Sweet Home a break during Jamboree weekend, there are lots of other days in August to burn! Is that asking too much?